Transflective displays are something that we've been keeping an eye on for a while now, because mobile devices have this crazy thing where they are really nice to use outside, in the sunshine. But, traditional display technologies, while getting better in direct sunlight, are still not a great solution. Transflective displays fix the problem by being a hybrid LCD/eInk-like display, which can not only be much easier to read in the sunshine, but use far less power. We've known for a few months that Pixel Qi was working on new transflective displays that had higher resolutions, but we certainly didn't expect the announcement that just happened. 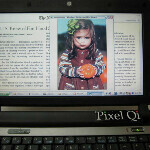 In a new blog post, Pixel Qi founder Mary Lou Jepsen is touting that the new generation of Pixel Qi displays outperform even the iPad's Retina Display. Jepsen says that the new Pixel Qi is thinner and lighter, while providing the same resolution and "matching or exceeding contrast, color saturation, [and] the viewing angle" of the new iPad screen. All of that while using 90% less power. Of course, we have no way to verify the claims, because Pixel Qi is currently only shipping displays with a max resolution of 1024x600, but Jensen whipped up a fancy bar graph to show off just how little power the Pixel Qi screens use. We can certainly believe the power savings, but it's the claims of "matching or exceeding contrast [and] color saturation" that really makes us suspicious. Color saturation has always been the sticking point that has kept transflective displays from making the leap, so we really want to see this screen in action. Again, Apple is a reference for every manufacturer. They could do this 10 years ago (IBM, Toshiba), but somehow only now this PPI thing is important. Everyone was just waiting for the Apple for green light, and now they admire Apple for being "resolutionary". Apples screen on the ipad 3 just happens to be the current best as far resolution goes. So yeah, their gonna be the benchmarks when talking about other technology and resolution. Just like phonearena now lists the ppi On its spec pages, Because the retina display showed that crisper displays are based on ppi and not necessarily resolution. Not being pro apple here, just saying that even though apple didn't invent hi res, they have bought it back to the mainstream publics eye. People in large numbers have a short memory. It doesn't matter who starts something, just who made it popular. Extremely high PPI technologies existed way before Retina screen, but there were many historical and technological reasons why they refused to be implemented. Only when Apple decided to go with full WYSIWYG Retina screen everybody suddenly become aware of this problem, and now we admire Apple for a great innovation. Everything that is now actual in IT world is made by Apple, and everyone is letting it do that. It's a conspiracy of some kind. In which everyone profits - on people that are almost engineered with blindness. This Apple referencing is no coincidence. One would say that if someone will introduce new tech, that it will be distanced to Apple - but it's clear that everything depends precisely on referencing to it. Pixel Qi wants to make profits on Apple, not on their screen. Like I said. People have short memories. It doesn't matter who created something. Just who made it marketable. It also doesn't hurt when your company is the most valuable in the world, valuing over half a trillion dollars. Once again, it's NOT apple's screen. It is SAMSUNG's screen. Apple just assembles it. Apple's marketing makes it seem like they are a leader and everyone else is following. This is not the case. All manufacturers have increased resolution as screen technology improved (most are buying from the same few sources), only Apple gave it a flashy name and talked about it like it was a big deal. Other manufacturers have been pushing pixel density, contrast, and particularly screen size harder than Apple. HD just doesn't seem new in the way that "Retina" does, even though "Retina" is just a fancy marketing term for ppi. In the old school CRT days, it was dpi, and manufacturers were all pushing that long before Apple got into the game. Those same companies are making LCDs now, so don't pretend Apple taught them to chase something new. It's the same old stuff. I look forward to this fall, when Apple rolls out a 4 or 4.3" phone and gives it some absurd branding like Ergo. I am sure you'll hop on here and claim they are a leader in large phone sizes. When there was dominantly PC era, screen resolutions increased but pixel densities weren't. Only Apple was able to intitiate that, despite the fact that high densitites were technologically available. The same goes for IPS panels, which are in pro segment for over 10 years or so, and industry rejected them (and VA) in favor of inferior TN panels, and only after Apple introduced IPS (and that's e-IPS, cheaper technology) on an iPhone everyone begun to compete with ultra-high quality displays... So Apple was the key for every turning point, the motivation for the whole Industry. Technologically speaking, it wasn't. No one else did it like that - especially not the first SE Xperia X1 with its 312 PPI density in 2006.! Lol I never said they're a leader, innovator, or creator. In fact i I completely support your comment. I'm just saying apple made it marketable and that's what matters, not who creates something. And I only mean in the eyes of the masses. If apple is a leader or innovator in anything its marketing mid range tech. They do that better than anyone. My response to your extremely reductive reasoning grew too long, so I'm just going to make it a proper column. Thanks for the inspiration! My reasoning is extremely reductive on purpose, because in relativisation of everything you just miss the point and fall into fragmentation. Problems simply cannot be seen by taking into account all the facts that are scientifically measurable. Social research and philosophy can thus see much clearer something that cannot be quantitatively measured. The World is now calibrated to aesthetics constituted by Apple. In all the opposite camps, the ghost of Apple defines everything they do. Apple is in everything that is aestheticized - that is, everything that is not a truth procedure of other kind, like politics, knowledge and sexuality. I liked this discution more than post :) Thank's for yours opnions, everyone says a bit of I would to see here.